The Port & Company youth Fan Favorite tee is sure to become a wardrobe favorite for your child! Available in an array of colors, this comfortable and trendy 4.5 oz. top is made from 100% ring-spun cotton (some colors are made from a cotton/polyester blend). It features 30 singles and a tagless private label option, and it is CPSIA tracking label compliant. Perfect for schools, sports teams and more, it can be customized with an imprint of your brand logo. Make sure your kids are dressed to impress! The Port & Company youth performance blend tee will help get your kids up and moving! This terrific 4.5 oz. top is available in several colors and is made from a blend of 65% polyester and 35% cotton. It features a tagless private label option and is CPSIA tracking label compliant. A great giveaway for schools, summer camps, sports teams and so much more, it can be customized with an imprint of your company logo and message. Promote an active lifestyle today! Create a storm of new attention for your brand with this Delta Apparel Youth Retail Snow Heather Tee! Made of 4.3 oz./146 GSM 58% cotton/42% polyester, it's offered in a large range of sizes and can be customized with a unique silkscreened imprint. It features short set-in sleeves, a 3/4" seamed rib knit collar, taped neck and shoulder seams for durability, two-needle hemmed sleeves and bottom that won't unravel and a quarter turn to eliminate a center crease. There's a tagless private label option, and this tee is CPSIA tracking label compliant. Enhance the look of your next promotion! For a must-have addition to any child's wardrobe, look no further than the Next Level youth tri-blend crew tee. This trendy 4.3 oz. top is available in an array of colors and is made from a blend of polyester (50%), combed ring-spun cotton (25%) and rayon jersey (25%). It features 32 singles, a 1x1 baby rib-knit set-in collar and is fabric-laundered for reduced shrinking. An ideal giveaway for any business, it can be customized with an imprint of your brand logo. A wow-worthy wearable for your next promotional campaign with the Port & Company youth core blend 3/4-sleeve raglan tee! This stylish 5.5 oz. 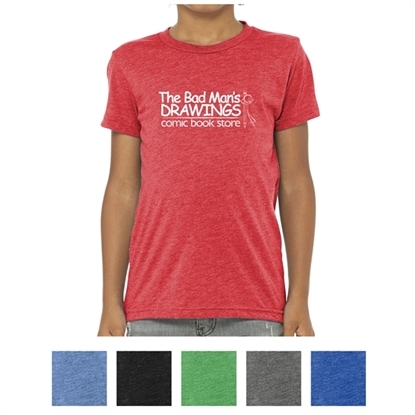 shirt is available in a wide array of colors and is made from a 50/50 cotton/polyester blend, with up to 5% recycled polyester from plastic bottles. It features a tagless private label and is a great way to promote sports teams, resorts and so much more. Customize with an imprint of your company logo and message for increased brand exposure. Retail Fit. Tear-Away Label. Side Seamed. 3.8 Oz.50/25/25 Poly/Airlume Combed And Ring Spun Cotton/Rayon, 40 Singles. Tagless Private Label Option. CPSIA Tracking Label Compliant. Mypromotionalpens.com offers the largest and best priced selection in Promotional Childrens Polo Shirts. We will price compete and we won't be under sold. Let our graphic designers make your personalized Childrens Polo Shirts standout above the crowd at no charge. We won't stop until you are completely satisfied with your custom Childrens Polo Shirts art proof.Use category search filters on your left to help narrow your search to find exactly what you are looking for.